WELCOME: The disciples of Yogacharya Raparti Rama Rao, pioneer in the field of Anustana Yoga Vedanta, founded the Yoga Consciousness Trust in 1983 with a vision to help every individul to tread the path from darkness to light by awakening the inner Chaitanya (Divine Energy or Yoga Consciousness) with a systematic training in the Guru tradition. The mission of Yoga Consciousness Trust is to develop the individual personality in all its entirity (physical, mental, emotional & spiritual planes) through systematic practice of yoga and vedanta in daily life. The symbol of our institute reveals the process of creation and the path of sadhana, to unfold the secret of creation called absolute, i.e. the merger of the individual soul in the cosmic soul, which is the purpose of human life. The absolute gave birth to the Cosmo. Cosmo gave birth to the ego. From ego five elements of nature are born. From them the sense organs and mind have come out and thence the three basic qualities pervading the physical world called socialistic, egoistic and lethargic (satva, rajas, tamas) natures, which are indicated in the emblem.The blue color base of the emblem denotes the absolute spring that holds the entire universe. The stem of the lotus denotes the ego. Its five lower petals denote the five basic elements of nature; its seven upper petals denote the five sense organs, the mind and the discriminative faculty called 'buddhi' on one hand and the seven basic elements of the body on the other. The tricycled serpent figure denotes the latent and dormant energy hidden in the human body, which is beyond mind and sense organs. The three bends further denote the three psychic conductors called 'Ida - on the left, Pingala - on the right and Sushumna - in the center'. The six layers of the torch from the Sushumna signify the six energy centers (shat charkas). The symbolic expression of absolute is denoted by 'om'. On reaching the thousand petalled cosmic energy center in the brain by meditating and by chanting 'om' one experiences the absolute and that experience is 'Yoga Consciousness'. Guruji Yogacharya Sri Raparthi Ramarao garu belongs to the Guru Clan of the great and famous Himalayan Yogi Sri Sri Sri Ramlal Prabhuji Maharaj. Sri Ramlal Prabhuji is such a great Yogeswar that he cared more for realization of self only even though he had all the eight Animadi Siddhis at his command. He belongs to such a greatest clan of yogis. 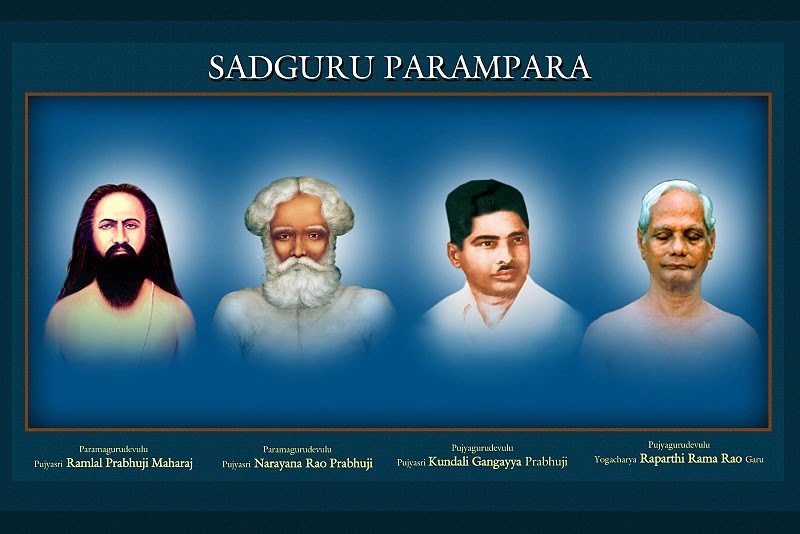 Sri Ramlal Prabhuji is a great master, who with his astounding spiritual powers, not only elevated many spiritual aspirants through shaktipatha, but also saved by showering his mercy on many erring individuals who were exhibiting their occult powers for attracting the people and brought them on to the track of seeking the knowledge of soul. He cured many diseases through his powers. The greatest yogi stayed in his mortal body for 51 years and left it in 1938 and travelled in the from of an all illuminating Jyoti and merged in the Ultimate Reality. In accordance with one of the sacred plans of the Almighty, in order to uplift the common man spiritually, Sri Ramlal Prabhuji directed by customs of the Guru Clan followed the path of Astanga Yoga and mastered all Yogas.